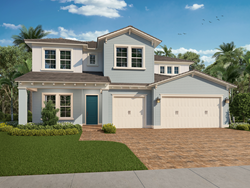 Leading South Florida homebuilder Lennar will debut its new home designs for the anticipated master-planned Arden community in Wellington during their special Fall Harvest Festival this Saturday, Nov. 4. Attendees can also take advantage of the homebuilder’s Pre-Grand Opening Special Pricing. Prospective homebuyers and their families are invited to attend this free “Watch Us Grow! Fall Harvest Event at Arden” running from 11 a.m. to 2 p.m. The day’s activities will include live music, hayrides, a petting zoo, face painting, food and drinks, prizes, giveaways and much more! Attendees will have the chance to get an exclusive first look at Lennar’s spacious new home designs for their collection in the over 1,200-acre gated community, and can take advantage of the homebuilder’s Pre-Grand Opening Special Pricing. Arden’s luxury enclave offers a long list of truly unique and impressive amenities, including a year-round event and activities program with an on-site Lifestyle Director. An expansive, two-story community clubhouse will house a 3,000-sq. ft. fitness center with a private group exercise studio, an inviting Wi-Fi café, a spacious club room and other gathering areas. The amenities continue outdoors with a two-level, resort-style pool with swim lanes, a section built for relaxation with cabanas, and an interactive splash pad for children. Residents will also enjoy four illuminated Har-Tru tennis courts, 30-acres of parks, playfields and playgrounds, 20 miles of expertly-mapped walking and biking trails, a community farm with seasonal classes and a boat ramp and watersports on Arden Lake. Located at 19425 Southern Blvd in Wellington, FL, the community is ideally situated near the area’s renowned shopping, restaurants and world-famous equestrian center, as well as top-rated Palm Beach schools and an adjacent wildlife preserve. More than 40 acres of the community is also dedicated to a future on-site public school and park. For more information about Lennar homes at Arden, interested homebuyers and realtors can call 855-810-4956 or visit lennarpalmbeach.com.